Yuuguu - Share your desktop through Gmail and Google Talk ~ Android Forever! 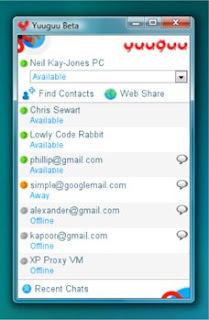 "Once you have entered your Gmail or Google Talk account details into Yuuguu, your Gmail and Google Talk contacts will automatically appear in your Yuuguu contacts list. You can share your screen with only one click each. Your contacts will be notified that you want to share your screen by way of a web address and, on clicking this, they will be automatically taken to a browser window containing your screen share." Barry's Best Computer Tips is updated often; the easiest way to get your regular dose is by subscribing to our news feed. Stay on top of all our updates by subscribing now via RSS or Email.